The niftiest object we can see every Valentine's Day is the bright red star I call the Valentine's Day star because it's at its highest point above the horizon every Valentine's Day night between the hours of 8 and 9 p.m. your local time. It marks the shoulder star of Orion and its name is Betelgeuse. Betelgeuse changes its size regularly like a gigantic slowly pulsating heart that beats once every 6 years. Now when Betelgeuse is fully contracted at its smallest size it is a whopping 500 times the width of our Sun but when it expands to its biggest size it is almost 900 times as wide. The shoulder star of Orion the Hunter is named Betelgeuse, which most people pronounce beetlejuice, some BET-el-jooz, and others BET-el-jus. This star has an interesting word history. It is the brightest red star we can see with the naked eye from planet Earth and it reaches its highest point in the nighttime sky at about 8:30pm on Valentine's Day, February 14. Just Look Up and due south! See Navigating with Orion to locate other stars. Betelgeuse has no equal in sheer volume or area of influence and emanates a tremendous amount of magnetic force from its fiery heart, which beats regularly! In esoteric writings it is said there are potent and influential forces streaming from this star. Forces that can stimulate the heart center and aid in the service of those who are spiritually attuned. 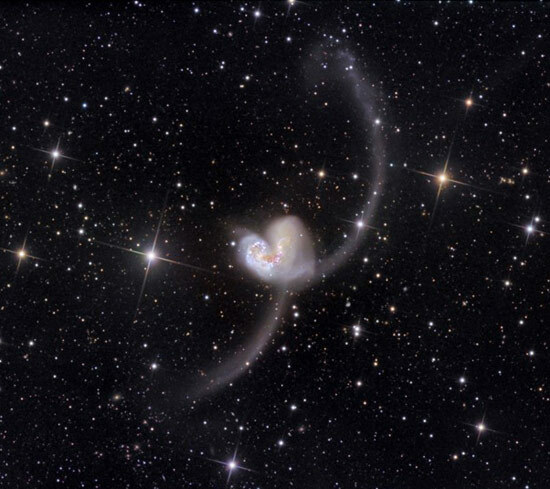 This star is truly your Cosmic Valentine. 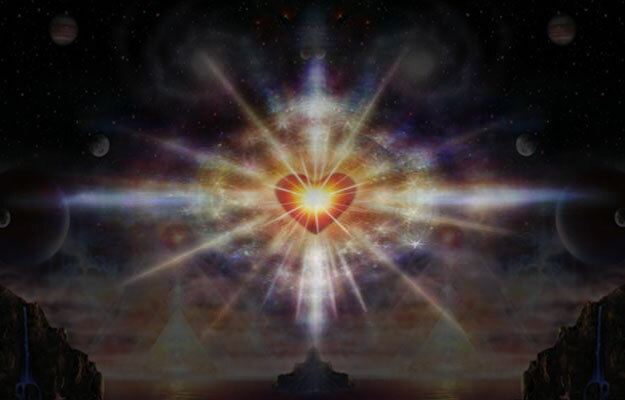 Open your heart and spirit to the the qualities of Betelgeuse. Receive your Valentine’s gift! May Valentine's night expand your heart and make your spirit soar to new heights! Learn how the Valentines Star, Betelgeuse, can affect us. Betelgeuse is an extremely large star, pulsating in approximate size from the equivalent of Mars' orbit, to that of Jupiter's! On Valentine's Day give and receive the biggest Valentine of all, a giant red star, pulsing like a heart full of cosmic love. BIG time Betelgeuse Valentine fun. Send a Global Sonic Valentine to Gaia! Annual World Sound Healing Day. Valentine's event ending violence against women. Where the Earth becomes a magnetic center, a station of light, a point of great radiance and vitality, beaming out into the Universe. Links to star maps, sky calendars and more. Top graphic: Adaptation from "Light 1"